It's about damn time. While Pandora has been slowly and steadily updating its Android app for years (the latest big update was a sleep timer), the tablet experience has been sorely lacking ever since Honeycomb. The music streaming service has redeemed itself with version 5.0 of the Android app, which now shifts the interface significantly on Android tablets. 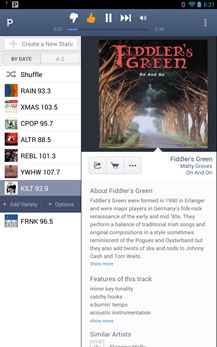 The main play interface occupies the center of the screen, going back through your play history with album art and displaying contextual track information below it. On the right you'll find the list of your stations, with options to add variety or share them socially available as pop-up menus. You can also arrange them alphabetically or by the date you created or added them - a nice touch. The settings open on the left, accessible from the action bar or as its own icon if you're using the app in landscape mode. The profile icon lets you see a more complete, dated history, including likes and the capability to remove them. There's also a token "find people" option if you feel the need to engage in Pandora's semi-closed social network. The interface isn't exactly Holo, but it's attractive and effective. 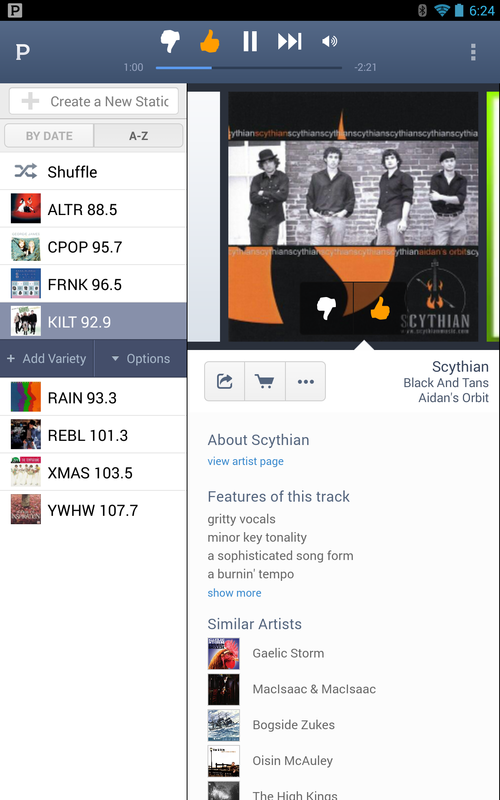 Pandora is my primary source of radio-style listening, so I'm thrilled to see such work put into the Android app. One thing I'm not thrilled about: the sleep timer seems to have disappeared. Here's a reliable alternative if you need one. There's also no notification controls - oh well, gotta save something for the next update. 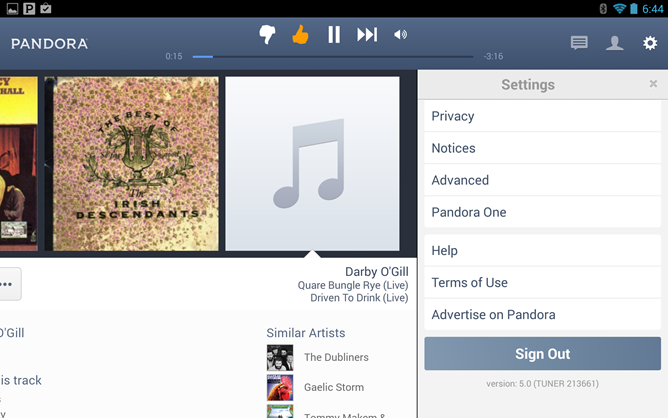 Experience the best Pandora yet with our new app design, now optimized just for your tablet. 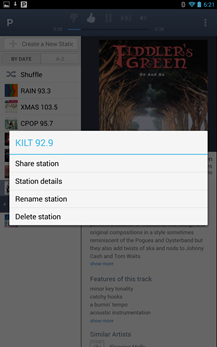 Take advantage of all of the features you love on your tablet - add variety to your stations, view your thumb history, and see track lyrics. Just swipe your tablet screen to explore without interrupting your music. The new third pane makes it easier than ever to view your music feed and personal profile or find new artists and tracks. Update: Commenter One An9gry N00b points out that the Play Store screenshots now include a Chromecast icon. 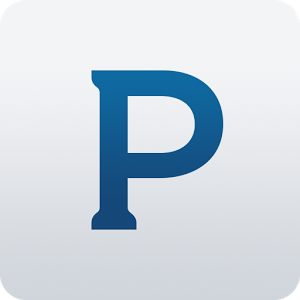 Chromecast support is nowhere to be found in the app itself, but this is a definite indication that Pandora is looking to support the device in the future. The screenshots are probably from a slightly newer developer build. Update 2: Hey look, they turned on Chromecast support.